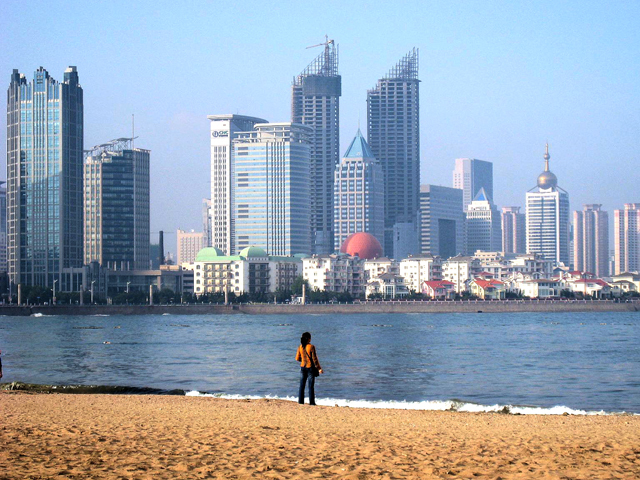 What moved the dial on sustainable cities in 2014? TheCityFix’s Year in Review recaps trends to watch for the urban future. Photo by Birger Hoppe/Flickr. With urban growth come a number of opportunities to positively transform our cities. And while the unique challenges faced by city leaders are shaped by local contexts and histories, their actions reveal broader trends in how cities worldwide are changing to better serve their residents. Supported by a combination of political leadership, citizen innovation, and global knowledge networks, 2014 was a year of remarkable progress for urban sustainability. This focus on cities was reflected in multiple international arenas. For instance, the latest draft of the U.N. Sustainable Development Goals (SDGs) includes an explicit goal to make cities “safe, inclusive, and sustainable.” The Medellín Declaration put forth at the end of the seventh World Urban Forum (WUF7) in March places equitable cities at the core of global development. Finally, climate negotiators at the U.N. Climate Summit and COP20 built strong consensus around the importance of cities in winning the fight against climate change. These developments bode well for advancing urban sustainability as we move into a pivotal year for the international agenda. In 2015, we can expect to see the finalization of the SDGs and an international climate agreement at COP21, all leading into 2016’s HABITAT III conference on housing and sustainable urban development. 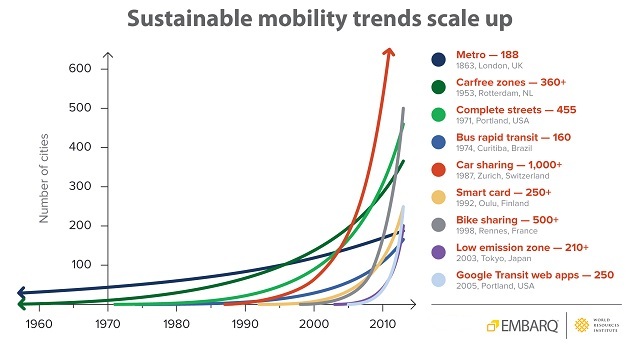 More people in cities means we need mobility options that move beyond the personal car, and 2014 provided us with plenty of reasons to be optimistic about the future of sustainable urban mobility. From established solutions like bus rapid transit (BRT) scaling up to newer shared-use mobility systems like bike-sharing, car-sharing, and ridesharing taking hold in emerging economies, it was a year of major progress for cities built to move people, not cars. While the specific reasons vary from city to city, there are a few explanations for these growing trends that ring true across the board. For one, the number of new technologies to fuel citizen participation and innovation grew substantially in 2014, tapping the power of businesses and civil society to help city leaders advance sustainable mobility. Additionally, we’re also seeing a generational shift away from car culture towards more flexible mass transit and shared mobility systems. In places like Mexico, India, and Brazil, the preference for sustainable mobility options over cars has even been embedded in official policy. It almost goes without saying at this point, but our cities are growing at an unprecedented scale and pace. According to the 2014 revision of the U.N. World Urbanization Prospects, 66% of the world’s population is expected to live in cities by 2050, up from 30% in 1950. Africa and Asia are currently the only regions with majority rural populations. They’re also the fastest urbanizing regions and are expected to be solidly urbanized by 2050. Asia is already home to 53% of the world’s urban population, and China – which boasts the world’s largest urban population – is building its national development plan around urbanization. Does this rapid urban growth present challenges for creating sustainable, livable cities? Certainly, but it also means there are huge opportunities to improve quality of life for billions and boost global economic growth through city-level action. Not only that, but these goals go hand in hand. Analysis from the Better Growth, Better Climate report released in September shows that sustainable, connected urban development could save cities US$ 3 trillion in infrastructure investments over the next 15 years. Cities may be the source of many challenges to sustainable, equitable development, but they’re part of the solution, too. Progress in 2014 does not mean we can rest on our laurels in the year to come. Rather, we at TheCityFix hope that 2015 will be a banner year for urban sustainability. We hope mayors and city leaders will take bold actions on climate change, traffic safety, public health, urban equity and other chronic challenges for the world’s cities; we hope their citizens will not rest until they do. We hope to see more platforms for financing sustainable solutions and global networks to help cities make urban sustainability a reality. And of course, we hope to see many of you – our wonderful readers – again in 2015 as we continue to chronicle the latest trends, innovations, advances, and ideas in sustainable cities and urban mobility. Check out the other entries in TheCityFix’s Year in Review series for more on the movements and moments that shaped our cities in 2014.